This is original comic book cover art for the Marvel Comics book "Steve Rogers: Captain America", penciled and inked by Arthur Adams and completed on 11-26-2016. It is a recreation of an Alex Schomberg cover for "All Select Comics #4" done in 1943. The art is on white bristol board measures 21 1/2 by 14 1/2, with the art covering most of the board. The art is inked, but traces of blue pencil used to lay out the art can still be detected. Art is signed by the artist. Hi all, this art is for sale by us, Arthur Adams and Joyce Chin, and we just set this account up. 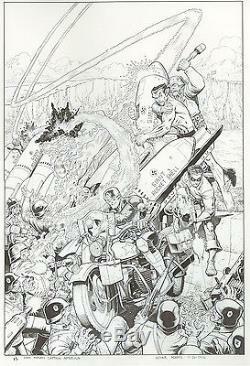 For prints and sketchbooks, please visit The Arthur Adams website at arthuradamsart. The item "Original Comic Book Art Arthur Adams, Steve Rogers Captain America Cover Marvel" is in sale since Wednesday, January 11, 2017. This item is in the category "Collectibles\Comics\Original Comic Art\Other Original Comic Art". The seller is "arthuadam_1" and is located in Walnut Creek, California.